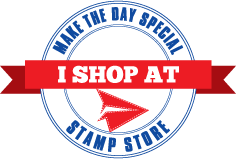 Make The Day Special Stamp Store Blog: Simple, Subtle, Sweet Decoupage. I don't think I'm the only one who thinks of decoupage as maybe being a little dated, and it conjuring up images of little quaint cottages etc, but as soon as I saw this gorgeous set from Paper Smooches, I knew I wanted to decoupage this little beauty right up! I stamped out my image, from Paper Smooches 'Best Buds', (an amazing set with a fresh modern take on florals - the stamps are almost tattoo like in their design - very cool), several times, and coloured them all the same using my Zig Real Brush Colour Pens and water. I then worked out which bits would go where, what would be at the back, what would be at the front, (Ok Ok, it's a tiny simple design, it wasn't exactly brain surgary! ), and cut out accordingly. I washed a small section on my card panel in Peacock Feathers and Mustard Seed Distress Ink, and built up my decoupaged banner over the top, using tiny slithers of foam tape to give depth and dimension. I wanted to keep everything clean and crisp, so matted onto some black card, and that was that. I really hope you like it, as always, everything is linked up below so be sure to go have peek. Gorgeous and a brilliant take on decoupage - making it clean and simple! This is really beautiful, looks really effective!